Learn how to protect your customers' privacy on the reviews they submit. Genbook offers you and your clients a few ways to limit the amount of personal information that's attached to client reviews. For example, your business can choose to not publish names that your clients have attached to their reviews. Many health and medical practitioners using Genbook take this step to protect the privacy of their patients. Go to the Settings page (gear icon at the top right of the screen), then click on "Customer reviews" and check the box next to "Suppress personally identifiable information" to ensure client names don't show up on their reviews. 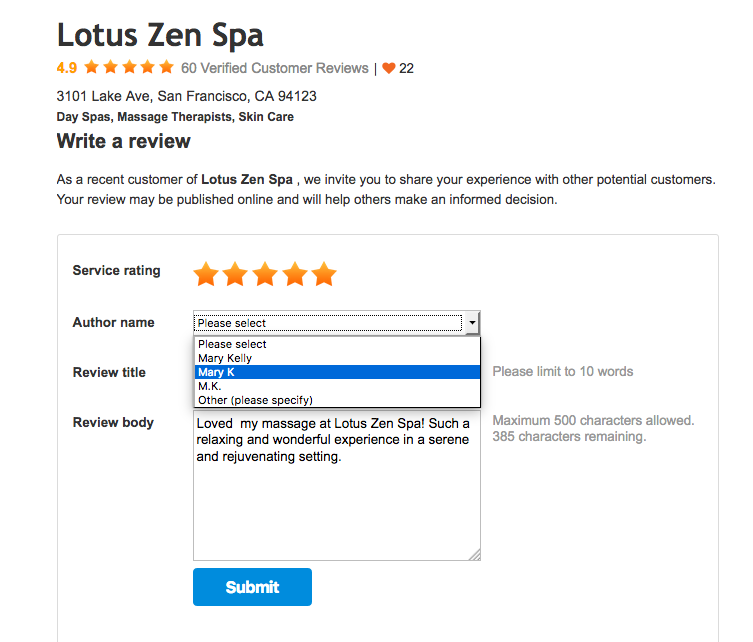 Also, your clients have multiple options for how their names appear on the reviews they post. They can attach their full names, first names and last initials, or just their initials. Some clients may prefer total anonymity, so Genbook also offers the option to use a different name altogether. Clients can simply choose "Other" from the Name drop down menu and enter an alias of their choosing.